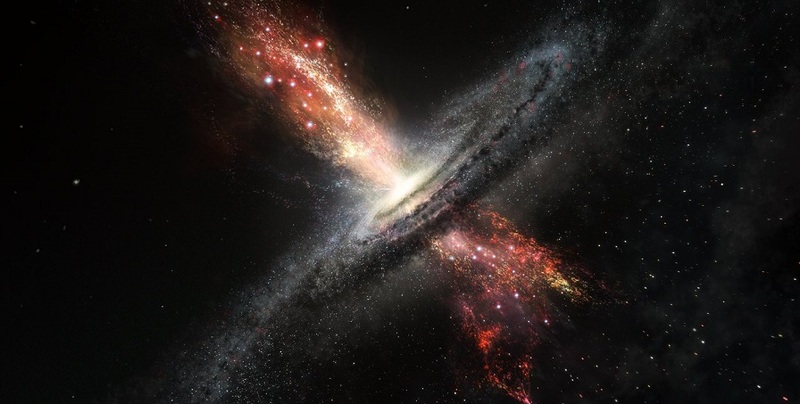 Observations using ESO’s Very Large Telescope have revealed stars forming within powerful outflows of material blasted out from supermassive black holes at the cores of galaxies. These are the first confirmed observations of stars forming in this kind of extreme environment. The discovery has many consequences for understanding galaxy properties and evolution. The results are published in the journal Nature. A UK-led group of European astronomers used the MUSE and X-shooter instruments on the Very Large Telescope (VLT) at ESO’s Paranal Observatory in Chile to study an ongoing collision between two galaxies, known collectively as IRAS F23128-5919, that lie around 600 million light-years from Earth. The group observed the colossal winds of material — or outflows — that originate near the supermassive black hole at the heart of the pair’s southern galaxy, and have found the first clear evidence that stars are being born within them. Such galactic outflows are driven by the huge energy output from the active and turbulent centers of galaxies. Supermassive black holes lurk in the cores of most galaxies, and when they gobble up matter they also heat the surrounding gas and expel it from the host galaxy in powerful, dense winds. The group set out to study stars in the outflow directly, as well as the gas that surrounds them. By using two of the world-leading VLT spectroscopic instruments, MUSE and X-shooter, they could carry out a very detailed study of the properties of the emitted light to determine its source. Radiation from young stars is known to cause nearby gas clouds to glow in a particular way. The extreme sensitivity of X-shooter allowed the team to rule out other possible causes of this illumination, including gas shocks or the active nucleus of the galaxy. The group then made an unmistakable direct detection of an infant stellar population in the outflow. These stars are thought to be less than a few tens of millions of years old, and preliminary analysis suggests that they are hotter and brighter than stars formed in less extreme environments such as the galactic disc. As further evidence, the astronomers also determined the motion and velocity of these stars. The light from most of the region’s stars indicates that they are travelling at very large velocities away from the galaxy center — as would make sense for objects caught in a stream of fast-moving material. The discovery provides new and exciting information that could better our understanding of some astrophysics, including how certain galaxies obtain their shapes; how intergalactic space becomes enriched with heavy elements; and even from where unexplained cosmic infrared background radiation may arise.